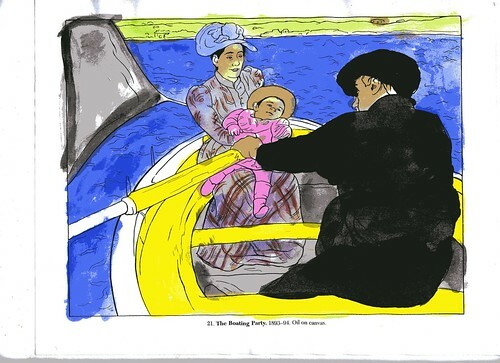 The boys decided they wanted to try to do some sort of activity to follow up their online gallery viewing and I just happened to have Color Your Own Mary Cassatt from Dover Publications. This is such a great coloring book for colored pencils or watercolors if you pull the page out and work at a table. Here are some paintings for you to get started in your study of this really fun artist. I hope you can take a few minutes this month to share this special woman impressionist painter with your children. She has a fond spot in my heart made by the subjects of her paintings, mothers and children are something I hold dear.